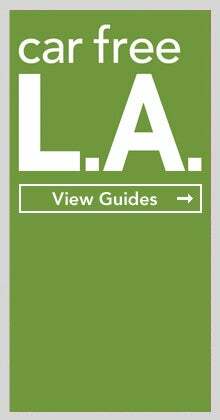 Los Angeles has one of the most exciting and influential dining scenes in the country. Contemporary L.A. chefs are creating globally inspired dishes that are already considered modern classics. For generations, many dishes that were created in L.A. have become culinary icons, featured on menus across the country and around the world. 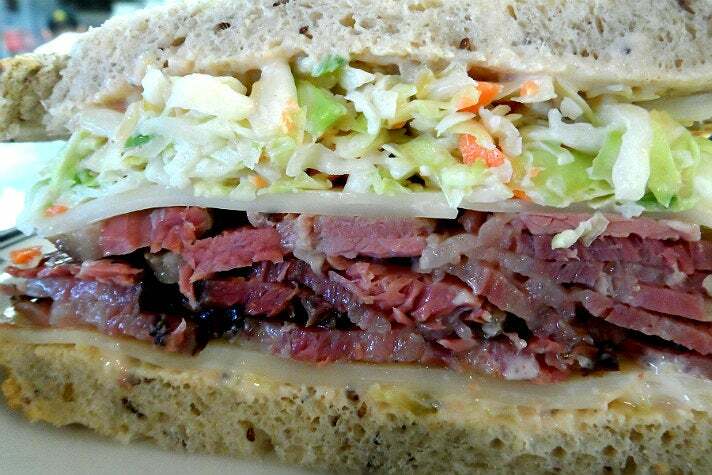 Here are classic L.A. dishes that have stood the test of time. 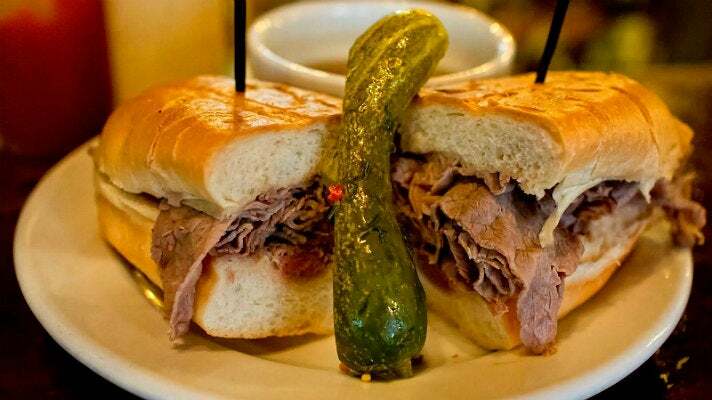 The true origin of the French Dip sandwich has been lost over time, but luckily for Angelenos the two landmark restaurants that claim to be its originator, Philippe and Cole’s, are both located in Downtown L.A.
Philippe the Original was opened by Philippe Mathieu in 1908 and has been at its current location on the edge of Chinatown since 1951. Philippe’s “official” version of the legend says the French Dip was born when Mathieu accidentally dropped a French roll into a roasting pan filled with drippings, and the policeman who ordered the sandwich agreed to eat it anyway. 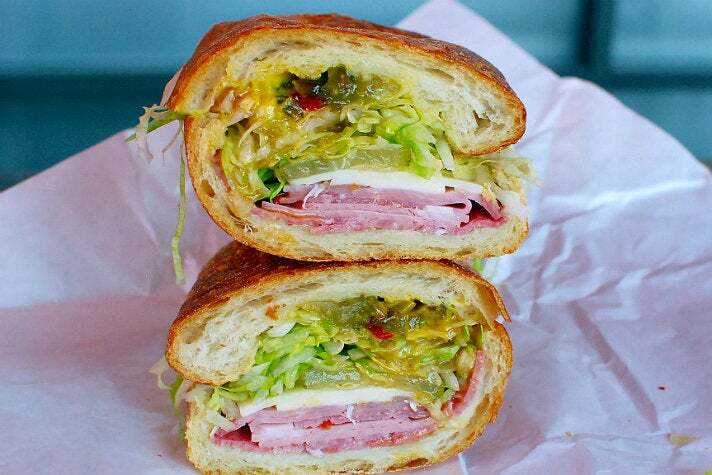 He and some friends returned the next day asking for the “dipped sandwich,” and it is now one of the top must eat destinations in Los Angeles. 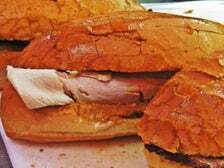 The cafeteria-style ordering routine at Philippe hasn’t changed in decades - queue up in front of the long deli counter and order from a “Carver.” The iconic sandwich can be made with roast beef, roast pork, leg of lamb, turkey or ham and is served on a French roll with several cheese options. You can ask for “single-dip,” “double-dip” or “wet.” Find a seat at a communal table and top your sandwich with a squeeze of potent hot mustard. 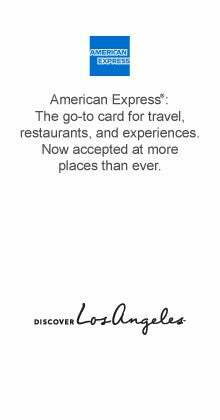 Cole’s also opened in 1908 and is still at its original location in the Pacific Electric Building which makes it one of the most famous places to eat in Los Angeles.. 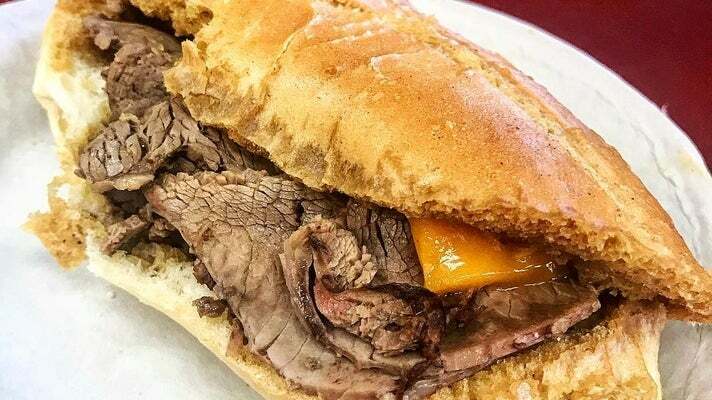 According to Cole’s, founder Henry Cole dipped a French roll in jus because it was too hard for a customer with sore gums. Other customers saw this and requested the same. 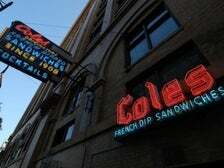 Cole’s has been serving French Dips ever since, with the exception of the 21-month renovation in 2007-08 that restored the original glass lighting, penny tile floors and the 40-foot mahogany Red Car Bar. 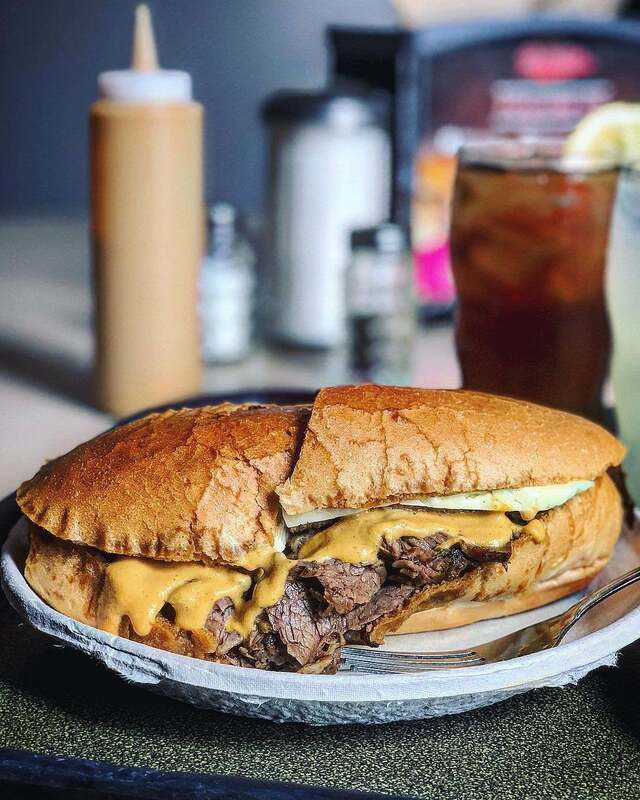 213 Hospitality proprietor Cedd Moses brought chef Neal Fraser on board to tweak the menu, so patrons can now order French Dips with lamb and goat cheese or French Dip sliders along with the classic options. One advantage that Cole’s has over its longtime rival: you can keep the night going at The Varnish, the award-winning speakeasy located in the back of Cole’s. Paul and Betty Pink founded Pink’s Hot Dogs in 1939 as a pushcart near the corner of La Brea and Melrose in Hollywood. 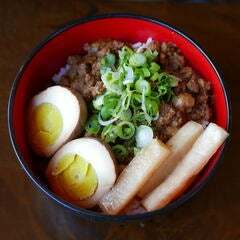 Their eponymous restaurant opened on North La Brea in 1946 and guests from around the world have been lining up ever since. It all began with a 10-cent chili dog made with Betty’s chili recipe, mustard and onions on a steamed bun. Today, the menu features 30 hot dogs, many named after celebrities and chefs like the Martha Stewart Dog (9" stretch dog, relish, onions, bacon, chopped tomatoes, sauerkraut, sour cream) and the Emeril Lagasse Bam Dog (9" stretch dog, mustard, onions, cheese, jalapenos, bacon, coleslaw). Pink’s hot dogs can also be enjoyed at Universal CityWalk, The Forum, Raging Waters, and this year's Route 66-themed L.A. County Fair. Pink’s hot dogs have become an iconic L.A. food. 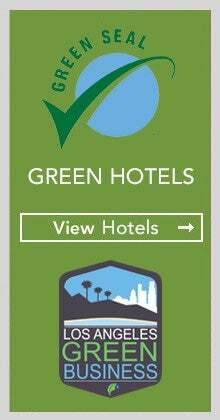 Generations of Angelenos have cheered for the Los Angeles Dodgers at Dodger Stadium, one of the true cathedrals of Major League Baseball and the site of some of the greatest moments in baseball history. The Dodger Dog is as much a part of attending a Dodger game as the national anthem or the seventh-inning stretch. 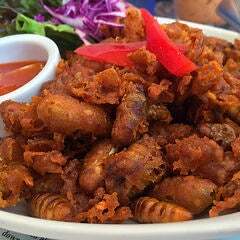 It’s one of those famous California foods that comes with a side of entertainment. The Dodger Dog was created in 1962 by Thomas Arthur, the ballpark’s opening concessions manager. 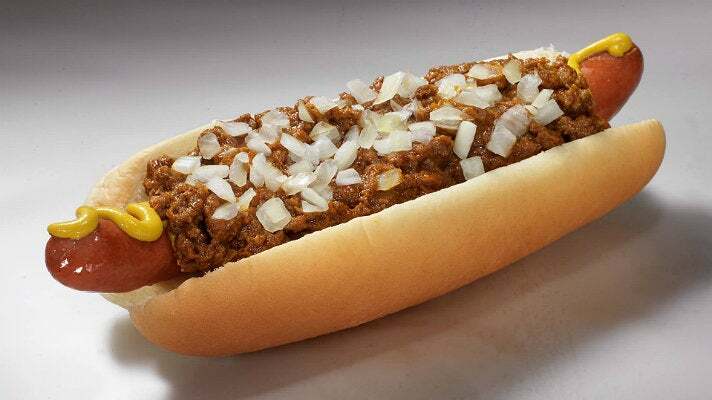 Arthur originally called the 10-inch frank a “footlong” but after fans complained he renamed it the Dodger Dog, and the rest is hot dog history. Farmer John took over the hot dog making duties from Morrell in 1972. 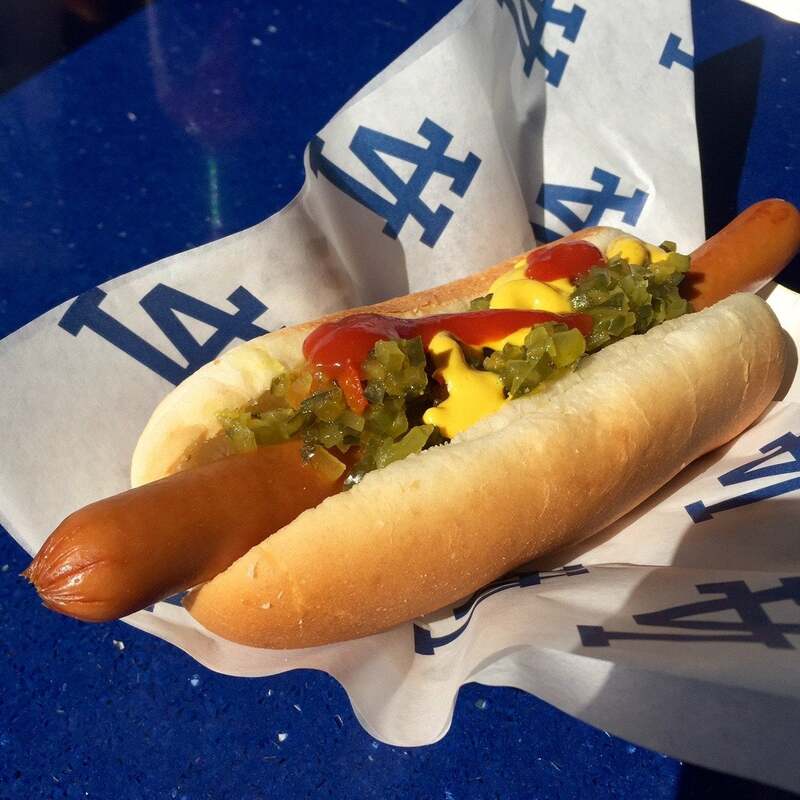 According to the National Hot Dog and Sausage Council, Dodger fans set a single-season record of more than 3 million hot dogs consumed at one stadium in 2014. You can order your Dodger Dog steamed, but purists will usually opt for grilled, topped simply with a squirt of ketchup or Morehouse mustard. Dodger Stadium now offers items like sushi and pasta, and you can even try variations like the spicy Doyer Dog with jalepeños and salsa. But baseball is also about tradition and devouring a couple of classic Dodger Dogs on a warm summer night is as good as it gets. Harlem native Herb Hudson opened Roscoe’s House of Chicken ‘N Waffles in 1975. 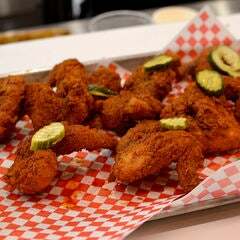 Roscoe’s has grown from the original Hollywood location on Gower to seven locations across the city. 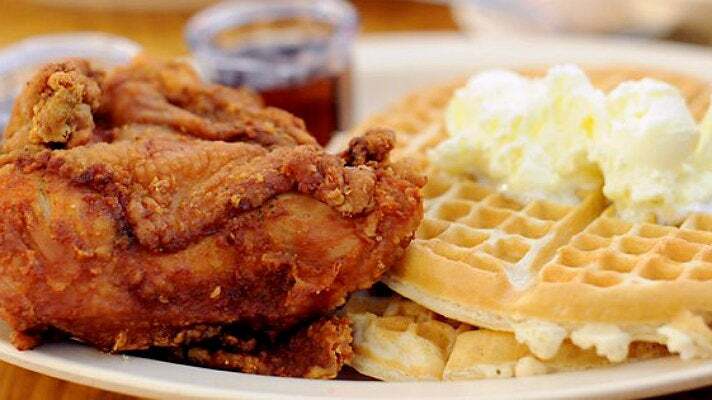 The soul food chain’s signature chicken and waffles is a delicious mix of salty and sweet, featuring juicy fried chicken and massive waffles. Options range from the basic quarter chicken and two waffles to Herb’s Special, featuring two waffles and a half chicken smothered in gravy and onions. 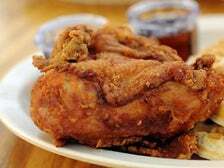 Soon after opening, Roscoe’s began attracting Hudson’s famous friends like singer Natalie Cole and comedian Redd Foxx, who told audiences at his stand-up shows about Roscoe’s. After President Barack Obama visited the Roscoe’s on Pico location in October 2011, the three-wing “Country Boy” plate was renamed “The Obama Special.” Roscoe’s has appeared numerous times in pop culture, including films like “Jackie Brown” and “Rush Hour,” Snoop Dogg's reality TV show and a name check in “Going Back to Cali” by The Notorious B.I.G. Open in Hollywood since 1919, Musso & Frank Grill has been a favored destination for generations of celebrities, from Charlie Chaplin to Johnny Depp. Some of the 20th century’s greatest writers were Musso’s regulars, including F. Scott Fitzgerald, William Faulkner and Raymond Chandler. . 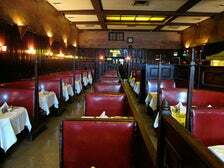 If you’re searching for iconic Los Angeles restaurants, the Musso & Frank Grill is one of those places.The extensive menu features classics like flannel cake, grenadine of beef and welsh rarebit, and daily specials like the famous chicken pot pie. 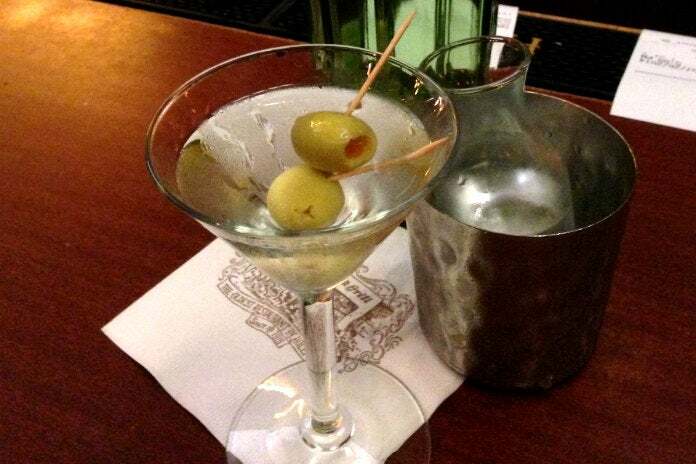 Even more than these favorites, the true Musso’s icon is the classic Martini, made with 2.5 ounces of gin and a half ounce of vermouth, stirred with ice and strained into a cocktail glass. It’s served with an olive garnish and a small carafe with the remaining cocktail on the side, a classy touch that’s rarely seen these days. Some guests prefer a Gibson (a la Cary Grant in "North by Northwest"), the same cocktail but garnished with an onion. Whether it’s an olive, a lemon twist or an onion, be sure to sip slowly and drink in the history of the room. 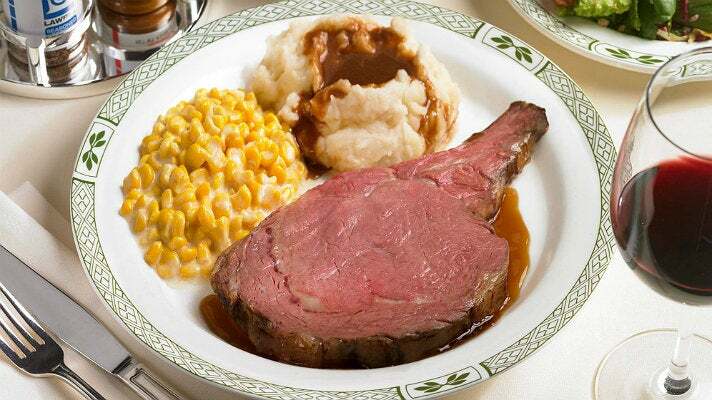 The original Lawry’s The Prime Rib opened on Restaurant Row on La Cienega in Beverly Hills in 1938. Since then, Lawry’s has opened a few locations across the country and several in Asia. Dining at Lawry’s is a familiar ritual that begins with the “three steps down” into the elegant dining room. Servers in retro uniforms take orders for the iconic prime rib dinner and serve the “Famous Original Spinning Bowl Salad” - romaine and iceberg lettuce, baby spinach, shredded beets, chopped eggs and croutons, tossed with Lawry’s Vintage Dressing. The standing rib roasts are carved to order from gleaming silver carts and served with mashed potatoes, Yorkshire pudding and whipped cream horseradish. Sides include creamed corn and buttered peas. 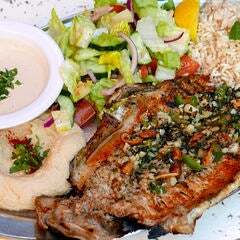 The most popular order is the Lawry Cut - options range from the California Cut for lighter appetites to the massive Beef Bowl, a double-sized cut with rib bone that was originally served exclusively during the Tournament of Roses. Lawry’s offers daily fish and vegetarian specials, but for carnivores this is nirvana. In 1982, legendary chef Wolfgang Puck opened the original Spago on the Sunset Strip in West Hollywood. It instantly became a celebrity hotspot and Puck continues to be synonymous with the entertainment industry. The opening pizza chef at Spago was Ed LaDou, who later developed California Pizza Kitchen’s first menu before opening his own restaurant, Caioti. 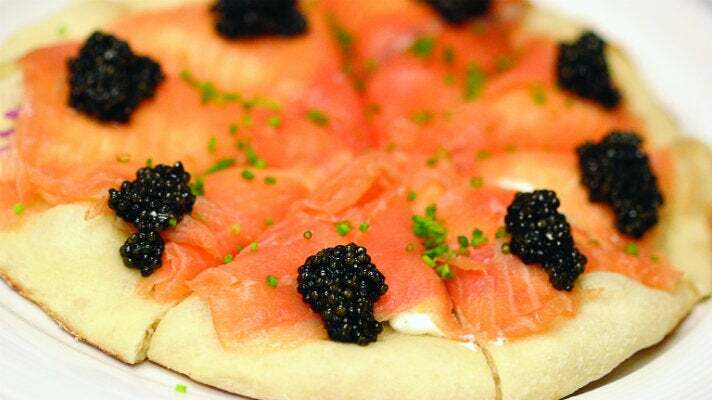 The smoked salmon pizza is Spago’s signature dish and a staple of California cuisine. According to Puck’s website, the dish was created when the kitchen ran out of brioche. The game-changing pizza is made with smoked salmon, chili and garlic oil, red onion, dill creme fraiche and chives. Puck says, “If you feel decadent, you can top the pizza with Sevruga, Beluga or Osetra caviar." Now located on Canon Drive in Beverly Hills, Spago still offers the smoked salmon pizza during lunch and as a bar bite. 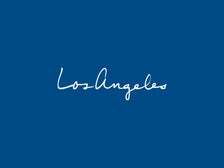 If you’re in search of classic Los Angeles restaurants, check out La Scala in Beverly Hills, opened by Jean Leon in 1956. 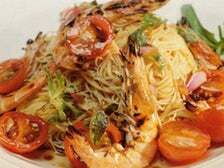 The Italian fine dining restaurant has been at its current location on Canon Drive since 1989. A favorite power lunch spot for the entertainment industry, La Scala has served six U.S. presidents and was the setting for Robert Wagner’s proposal to Natalie Wood. 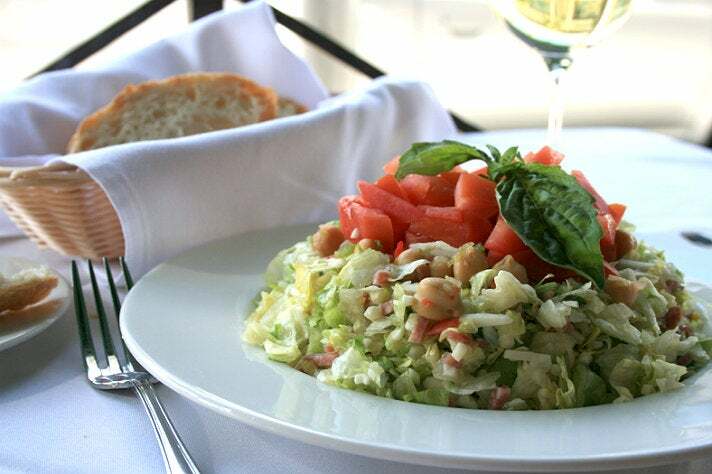 Leon’s claim to culinary fame is the now-ubiquitous La Scala Original Chopped Salad: lettuce, salami, mozzarella cheese, marinated garbanzo beans and the secret “Leon dressing.” The salad was originally made with julienned salami and cheese and was reportedly a favorite of Marilyn Monroe, Debbie Reynolds and Warren Beatty. After customers complained about the difficulty of eating the salad and still looking glamorous, the chef chopped it up. The iconic salad has since been enjoyed by Elizabeth Taylor, Leonardo DiCaprio, Kim Kardashian and Gwyneth Paltrow. Chopped salads can now be found on menus from Mozza to California Pizza Kitchen. With the motto “Quality Forever,” The Apple Pan continues to serve loyal customers who hover for a seat at the always busy U-shaped counter. Not much has changed at the landmark restaurant since it opened in 1947. 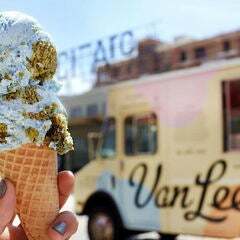 It’s still cash only, your order arrives on paper plates and your canned soda is served in a paper cone with a metallic cup holder. 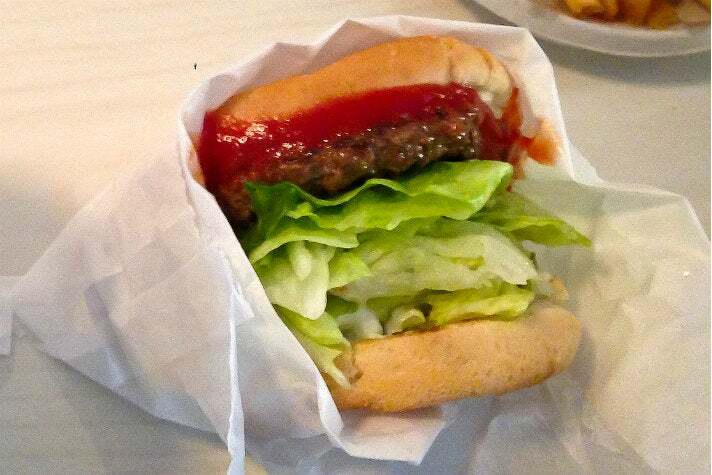 There are only two burgers on the menu - the standard Steak Burger and the iconic Hickory Burger, a must-try food in Los Angeles. 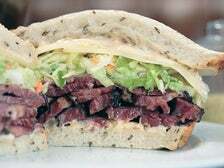 The latter features a beef patty with a sweet-smoky hickory sauce, mayo, pickles and chilled iceberg lettuce for crunch. Melted Tillamook cheddar is 50 cents extra. Add a side of old school fries and finish with a banana cream pie, which has a following as devoted as the Hickory Burger. Johnny Rockets founder Ronn Teitlebaum has said he modeled his diner-themed chain on The Apple Pan - to experience the real deal, head to the classic burger shack on Pico Boulevard. 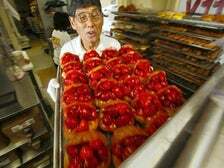 Founded by Jim and Miyoko Nakano in 1972, The Donut Man has been featured on numerous TV shows, including the Food Network, Cooking Channel and Huell Howser. Located on historic Route 66 and open 24 hours a day, the beloved little Glendora shop is renowned for its fresh strawberry donut. 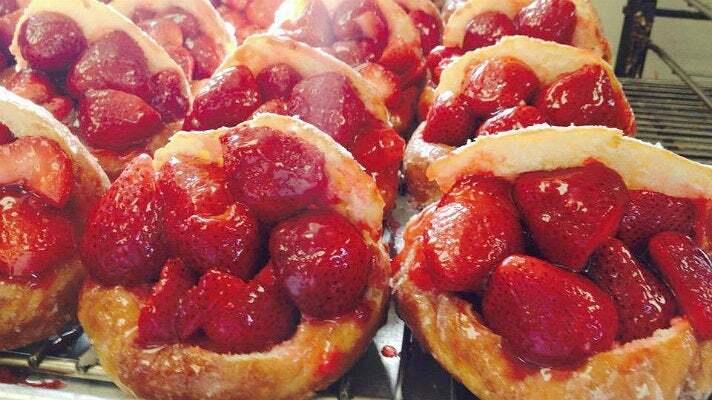 One of those L.A. foods made fresh with the season, the donut is overflowing with large, ripe strawberries and smothered in a signature glaze. The donut is large enough to require two hands to enjoy it, hamburger-style. Following strawberry season - roughly February to July - The Donut Man features its other signature item, the equally popular fresh peach donut. 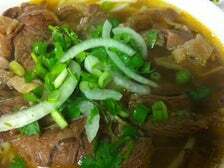 Opened in 1981, the original Golden Deli is the first Vietnamese restaurant experience for many Angelenos. But it’s not the generous portions of phở tái or bún bò Huế that attracts diners to line up in a San Gabriel strip mall - it’s the famed chả giò, or fried egg rolls. 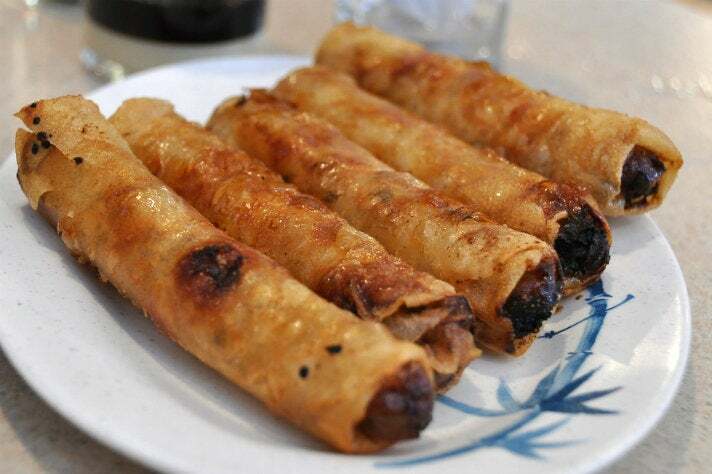 The hefty chả giò are filled with pork, mushrooms, cellophane noodles and carrots, wrapped in rice paper and fried until they’re crisp and golden. The glistening chả giò are served five to an order with a side of greens and nước chấm (dipping sauce). 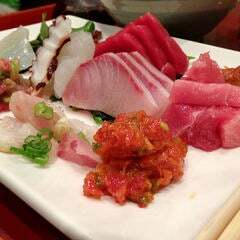 It’s definitely a must try food in LA. Los Angeles chefs continue to be in the vanguard of the national culinary scene. Read on for the next generation of iconic dishes that are ready to take their place in the L.A. food pantheon.